Many others including will writing, divorce and employment can be done by unqualified and unregulated individuals and organisations. "One service which crops up a lot is will writing. It's a service carried out often by will-writing firms who aren't regulated," said Mr Sampson. "Because of this, customers are left with little means of redress when things go wrong. "We've seen similar confusion about claims management companies, with lots of consumers believing they're getting a legal service even though most of the work is carried out by a non-authorised person. Again, we can't help." 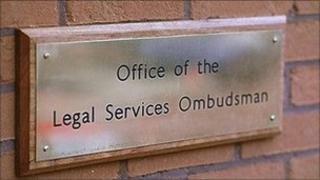 The legal ombudsman was appointed in October 2010 and can only act on complaints from those using the services of qualified lawyers. Which? executive director Richard Lloyd said: "As the legal-services market continues to grow in both size and complexity, it's crucial that consumers who have paid for a legal service that's not up to scratch know where to turn to get help. "We want the government and regulators to wake up to the current lack of clarity and to provide a clear and straightforward route of redress for consumers. "The arrival of a legal-services market in which consumers will, potentially, have complaints about hybrid services poses some serious questions about who they'll be able to turn to for help." Des Hudson, chief executive of the Law Society for England and Wales, said: "The gap in regulation which allows unregulated cowboys to operate in areas like will writing does not just cause unfair competition to solicitors, who provide a regulated, professional service. "It is also damaging to consumers because the unregulated providers are not insured, do not provide a compensation fund and are not covered by the Legal Ombudsman's scheme for consumer redress." She added the department will await the outcome of the Legal Service Board's ongoing work. An earlier version of this report included a reference to immigration services being provided by unqualified and unregulated individuals and organisations. In fact, these services are regulated by the Office of the Immigration Services Commissioner or other professional bodies, including the Bar Council.